While teachers continue to strike in L.A., the issues they’re fighting for are not new battles — they’ve been felt across the country for years. What do these teacher protests say about the state of U.S. education? 3 Reasons to Pay Attention to the L.A. Teacher Strike | KQED: The magnitude of the LA teacher strike makes it a powerful example of teachers starting to get fed up with the current state of the education system across the country. Tale of two LAUSD schools | Los Angeles Daily News: Though separated by just nine miles, these two L.A. schools experience the strike in very different ways — shedding light on the income gap in L.A.
“On paper, my school looks good … But we fight a constant battle against low enrollment due to competition from charter schools.” – Adriana Chavira writes as a Los Angeles teacher, a former reporter and a product of the Los Angeles Unified School District. What’s different about this wave of teacher strikes | PBS Newshour (April 2018): The L.A. teacher strike isn’t the first time these issues have surfaced across the country. Here’s a reminder of the teacher strikes and walkouts that occurred last spring in Arizona, West Virginia, Kentucky and Oklahoma. Are charter schools monopolizing public resources? 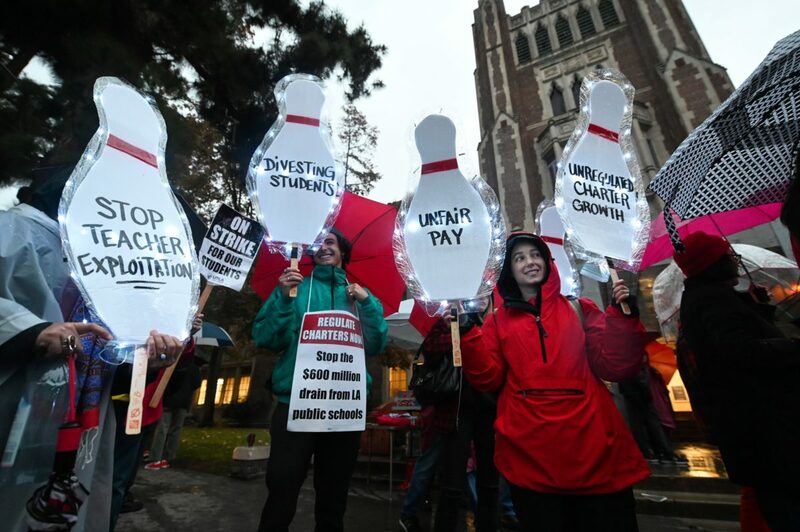 | PBS Newshour (April 2014): Competition with charter schools is not unique to the L.A. teacher strike. In 2014, PBS Newshour’s coverage of charter schools in New York reported on a similar concern around public funding of charter schools.